We deliver same day funeral flowers & sympathy flowers to Fairhaven Memorial Park Mortuary. Order funeral flowers & sympathy flowers for delivery online or call us and we will custom design your arrangements if you have something special in mind. Your family will be treated like our own, as we help you honor the life of the person you loved. We pride ourselves on exceeding your wishes. Our designers are experienced, loyal and dedicated to our customers. We have the experience and staff to handle any size funeral. Large or intimate funerals receive equal amounts of care when being prepared. All of our flowers are hand chosen for freshness and stored in our commercial grade cooler to ensure they remain as fresh as the day the were cut. Every one of our customers are equally important, our professional staff is dedicated to making your experience a pleasant one during this difficult time. Our funeral consultations can be done in person or by phone and are provided at no charge. We will plan and collaborate together on your desires of perfect funeral arrangements for your loved one. We will also offer suggestions in flower choices and design styles to compliment your ideas. On-time and ahead of schedule is how we like to do it. We will deliver and set up your flowers for you and make sure every detail is in order. We can also transfer your your flowers to the cemetery if needed. Leave the worrying and details to us. We will be there for you around-the-clock to ensure that you have the adequate amount of flowers. If you need to add something or make a change, we will be there with you every step of the way. As a full-service florist, our team can handle all your floral needs. We offer a multitude of funeral services including transferring your flowers to the final resting place. La Tulipe floral designs proudly serves Fairhaven Memorial Park Mortuary in Orange County, CA. Let us give you the peace of mind you deserve while you are going through this tough time. We create lovely displays of funeral flowers and greenery that will show your devotion and honor the departed. Our funeral flower arrangements express your sympathy beautifully, whether you're sending sympathy flowers for the home or a standing spray to Fairhaven Memorial Park Mortuary for the funeral service. 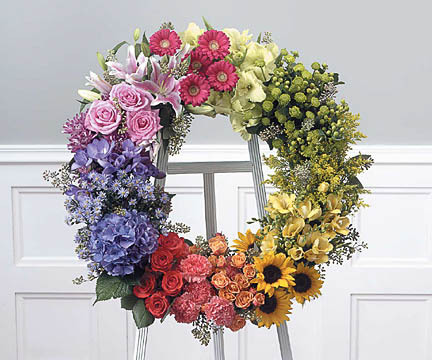 We offer a wide selection of funeral flower arrangements that celebrate a life well lived. You can send funeral flowers & sympathy flowers online for delivery today, tomorrow or a future date. If you have something unique in mind or need some suggestions just give us a call.